Best Bakery: Woodside Bakery. Pictured (left to right) Carolina Arroyo, Nichole Arends and Zoe Barnes. Best sandwiches? We have a new winner: Roberts Market in Portola Valley. Christine Roberts is general manager of both the Woodside and Portola Valley locations and says the deli experience might be more personal for customers in the newer store because it's not on a state highway, "not as crowded, and workers have a little more time to spend with them." The crew there also has fun coming up with its own signature sandwiches, naming and posting the specials on a blackboard. Ms. Roberts says people also like the fact that Roberts roasts its own deli meats, and "everything's fresh." "Isn't that wonderful. I am so happy about that," said Woodside Bakery co-owner Jan Sweyer when informed that the bakery she co-owns with her brother, Mark Sweyer, won the Almanac's 2017 Readers' Choice Award for favorite bakery. After many years in Woodside, the bakery is not yet a year old at its new location in Sharon Heights. Customers come for traditional labor-intensive baked goods, she said, including real French croissants, coffee rings, cakes and pies. A cafe serving breakfast and lunch is coming to the bakery within a year, with chefs trained by former Woodside Bakery & Cafe sous chef Ismael Guido, Ms. Sweyer said. Mademoiselle Colette prides itself in bringing the true essence of France to Menlo Park, with traditional French pastries, brunch, and lunch items, made with traditional French ingredients plus "love and energy," says owner Debora Ferrand. Customers can taste the love, especially in current customer favorites, the lemon tart and mille-feuille. 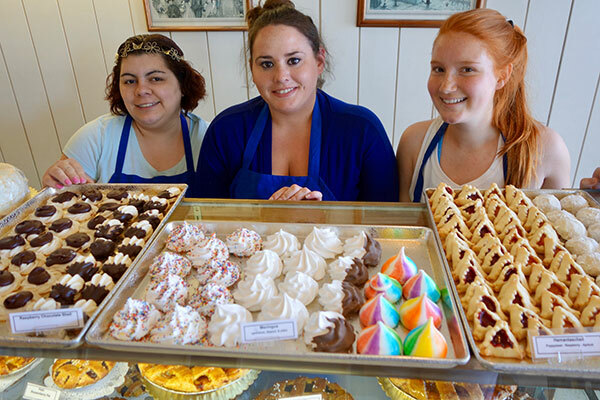 Opening in Menlo Park in 2015, the patisserie has been named favorite place for dessert by voters in the Almanac's Readers' Choice poll. "We make it all from scratch, from organic products," says Ms. Ferrand. At the end of the summer, Mademoiselle Colette's new kitchen will be completed, meaning croissants and pastries should no longer sell out, and allowing the patisserie to also be open on Mondays. More good news: a Palo Alto Mademoiselle Colette should open on Lytton Avenue in July. Best Dining with Kids and Breakfast: Buck's of Woodside. 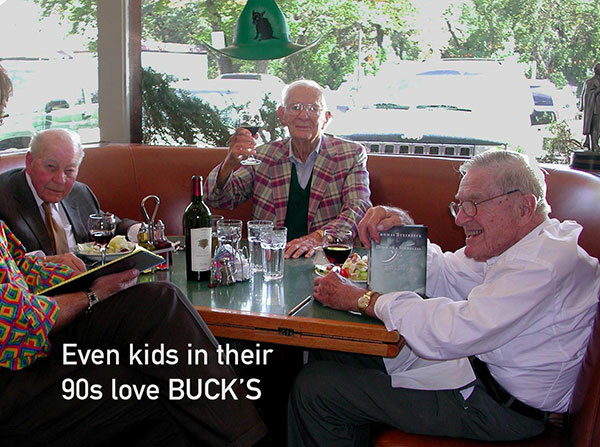 "Even kids in their 90s love Buck's" reads an ad showing a bunch of old regulars dining in a booth at Buck's of Woodside. This year the restaurant won two awards: favorite place to dine with kids and best breakfast. "In 26 years we've never had a bad baby," exclaims co-owner Jamis MacNiven. Children enjoy going on a treasure hunt to spot the unusual artifacts he has collected, and so do all the foreign visitors who stop at the restaurant on their Silicon Valley tour. He's ready for everyone, offering an American menu based on "consistency and evolution." Seven menus rotate but people keep coming back for the "killer" coffee cake and Dr. Perkins Breakfast Special 2.0. Jeffrey's Hamburgers has built a reputation in Menlo Park of serving consistent, high-quality food. "We do everything in-house," manager Steve Friebel said. "Our beef is freshly ground every day." The fun, quirky, 1950s-style diner offers a lot more than burgers, including soups, salads, seafood and a variety of sandwiches and shakes. Among the sandwiches: teriyaki chicken breast and a Caesar steak. Hot dogs range from the old fashioned to the Polish dog and the hot-and-spicy, all-beef Louisiana sausage. The restaurant has maintained the standards it set on its 2007 arrival in Menlo Park, and that's really what makes Jeffrey's a local favorite. Menlo Park's Baskin-Robbins has been voted the favorite ice cream shop by the readers of the Almanac. In addition to classic ice cream on a sugar, cake or waffle cone, Baskin-Robbins offers shakes and smoothies; soft-serve parfaits, from caramel banana to "strawberries and almonds"; and warm desserts, such as ice cream sandwiches with warm cookies, warm cookie and brownie sundaes, and warm lava cake sundaes. Beverages range from the caramel cappuccino blast to the Oreo milkshake and the freeze with orange sherbet. Menlo Park's shop is one of some 7,000 Baskin-Robbins locations across more than 50 countries. Although the company's business model is based on variety, including a flavor of the month, customers say they also love the consistent quality that the franchise has brought to Menlo Park. The family-owned Applewood Pizza has won this year's Readers' Choice award for favorite pizza place. Applewood has served the community for over 30 years, emphasizing the importance of fresh ingredients in customizable pizza. Although Applewood is known for the pizza, its menu offers not only a variety of other Italian dishes, but some Hungarian dishes as well, such as Hungarian goulash and sausage. This year's award for favorite happy hour place goes to Fleming's Prime Steakhouse & Wine Bar in the Stanford Shopping Center. Operating Partner Michael Vonnegut says that patrons, attracted by the values offered during the 5-7 p.m. happy hour, line up outside the doors for the 5 p.m. opening of the restaurant. Among those values: the prime burger, the house-made burrata, and Fleming's calamari with sweet chili sauce. Each item on the happy hour menu is $6, $7 or $8. It includes five cocktails, five wines by the glass and five appetizers, plus the prime burger. Seasonal Blue Moon beers are priced at two for $6. Mr. Vonnegut says he calls it the "5:05 Club" because on some days "if you don't show up by 5:05 you have to wait for a seat." As an added incentive, he says "we have an amazing patio, and happy hour extends to the patio area."